Since 7 years ago Iran allows the creation of private hunting areas. The first of these private reserves is located closet o the city Yazd and covers an area of 70.000 hectares of dry desert mountains. 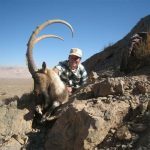 Through great effort by the owner, the number of animals has increased spectacularly, from 170 Desert ibexes to the current 1.500! 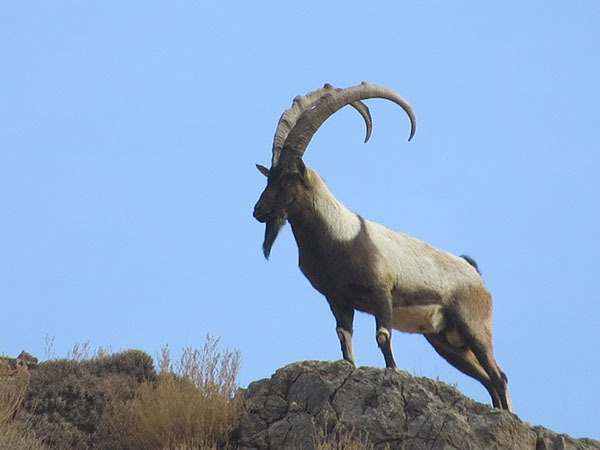 The number of Kerman sheep, gazelles and predators, such as leopards and hyenas, is also on the increase. The owner has built two houses within the hunting area, one cabin style, with bedrooms and one bathroom, and the other luxurious, with various activity rooms, electrical energy and WiFi. Lodging is possible in both houses, based on the hunter’s choice. Hunting license and reserve entry fees, trophy fee of selected game, first treatment of the trophy, 5 hunting days, lodging and full board during the hunt, all transfers during the hunt, assistance of a professional guide and English speaking interpreter. National and international air fares to Yazd, additional hunting days (€ 800 daily), touristic visits, trophy shipment, observer ($ 450 daily), tips, drinks and personal extras. Services package $ 1.000: reference number for visa, rifle import permit, assistance upon arrival and departure at Teheran airport.